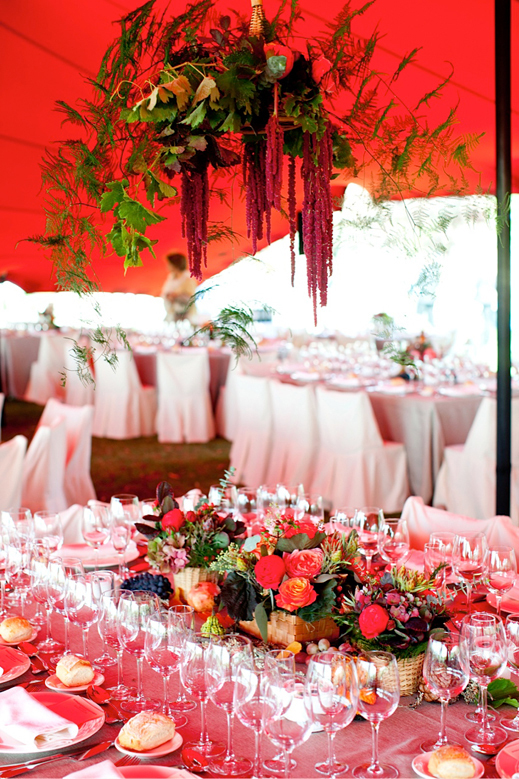 I wanted to share this inspiration because I love the bright berry red colors and the wild and drapey texture. There are actually two items that we are talking about making here; a stunning hanging wreath and a harvest style arrangement housed in darling little vintage fruit baskets on a long feasting style table. This project will make 5 hanging floral chandeliers/wreaths and 10 centerpieces! With a 5% discount code this cart will come to about $890. So that’s less than $1,000 for all of your reception flowers and this look is definitely lush and elegant! To make the wreaths you will need about two bunches each of the greenery, this will allow for nice drape and “hang”, 50 stems or so of hanging amaranthus, and if you wish, you can add a cluster or two of 3-5 roses and 5 stems hypericum berries to each wreath. Use your oasis wreath or create your own using three or so small chunks of oasis floral foam (you can wrap them in chicken wire and secure with matching twist ties to the wreath base. Your wreath base doesn’t have to be wire, it can be wood, whatever works for you is fine. Keep your amaranthus hydrated and in water till the day before the event, you can arrange the greens on the base two days early if you keep them cool and hanging up. Trim the stems down, leave enough to anchor into the foam, and tuck the greenery all around and through the base so that it hangs down nicely. The greenery just needs to be anchored in the foam so it is securely attached, but most important is that the hanging amaranthus be secured and have a source of hydration. 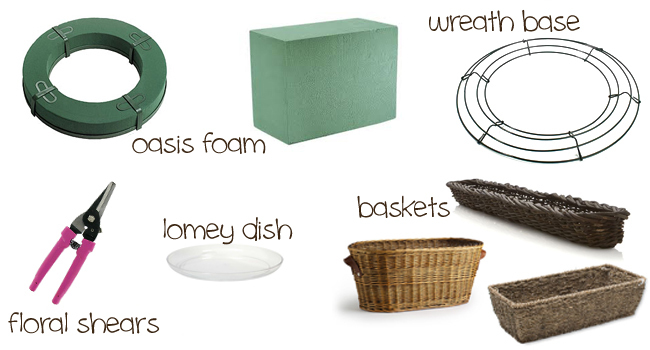 For the centerpieces, use a small waterproof container, or a half brick of oasis in a waterproof plastic liner (lomey dish) tucked into the basket. 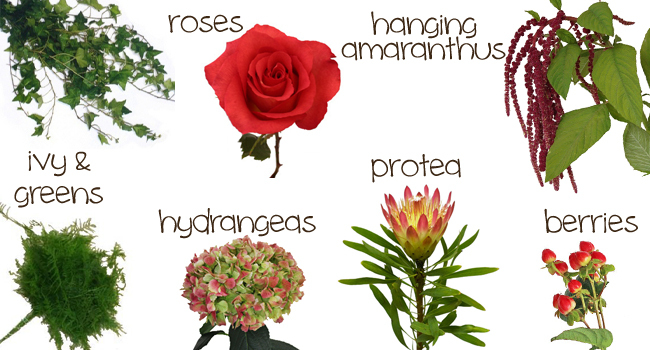 In each centerpiece you can use 2 stems protea, 1-2 hydrangea, 11 roses, 10-13 stems hypericum and greenery as desired. Start by placing in your larger items like the protea and the hydrangea, then fill in with the roses and the hypericum and finish by filling in any gaps with the greenery.